A Connecticut home with a notable architectural legacy gets an expansive update for a family of six. The kitchen cabinets in Japanese elm are topped with Calacatta marble and wraparound concrete for the island. 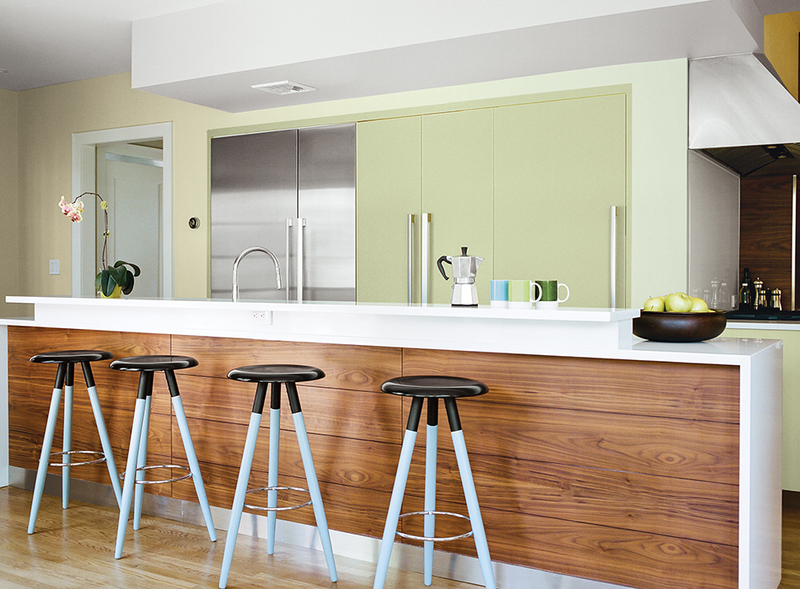 This San Francisco kitchen boasts sequenced walnut veneers and counters from Caesarstone. The Chrysalis bar stool is by One & Co for Council. A Foscarini pendant hangs above Ligne Roset’s Eaton table and bench. In this São Paulo kitchen, Silestone countertops were installed above custom plywood cabinets finished with automotive paint. A prefabricated off-the-grid vacation home in eastern Washington provides not just a getaway, but lessons in learning to be one with the land. The kitchen island is topped with PaperStone in slate and wrapped in the same steel used to clad the house’s facade. “We matched the color to create a ‘2001: Space Odyssey’ monolith,” architect Jesse Garlick says. He and his wife, Susan Elliott, a chef, cook at the commercial Wolf range they purchased at a restaurant supply store.